Possibly one of the most frequent questions I’m asked is just how I came to enter St. Mary’s Abbey and in truth, I myself sometimes marvel at how the Lord came to call me to this life in this place. I was raised in a practicing Catholic family in Dublin, had the benefit of a convent education and left school aged 16, with a good Leaving Certificate. At that time my only ambition was to spend my life in horticulture but I was too young to attend university and so instead, spent a year working as a trainee in a French nursery. On returning to Ireland I was joined in the business by my eldest brother and we worked well together for just under 22 years, by which time we had a thriving retail garden centre. In 1998 however, after much agonising, it was decided to sell the family business and this opened up an opportunity for me to satisfy a long held ambition to acquire a degree. To this end, in September 1999, I commenced a four year course of study in horticulture at Writtle College, Essex. It was at Writtle, while sharing a hall of residence with 15 other mature students (of many faiths and no faith at all), that I first began to question my Catholicity, spurred on by the informal religious discussions which occurred in the common room from time to time. On completing my degree it was fully expected that I would return to Ireland but I had little inclination to do so. In truth I didn’t really know where my next step lay, so I took a job as a garden centre manager in the beautiful town of Saffron Walden near Cambridge. There I received a great welcome into a small but vibrant parish and resumed my ministry of the Eucharist. I also met and came to know our parish sister who was a Brigidine nun from Ireland and it was to her that I turned when I could no longer ignore the persistent idea of a religious vocation. After some months of praying the Divine Office and attending daily Mass, I felt I had come to a major crossroads. I had to find out one way or another whether I had a contemplative vocation. It was with this in mind that I decided to attend a ‘Monastic Experience’ in St Mildreds Benedictine monastery in Kent. It was during my four days there that I had a very intense experience of God as I had never known Him before. 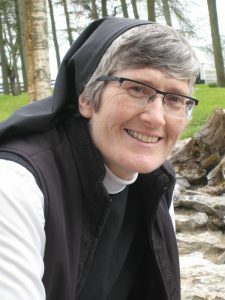 It was there too that I met a nun who suggested that Cistercian life might suit me and it was she who suggested I make contact with Sr Michele, the novice mistress at Glencairn. On January 3rd, 2006 I came to Glencairn for three weeks to experience the daily rhythm of monastic life as lived by a community. In some ways that was both the best and worst of the discernment process because while I was extended a very generous and warm welcome and felt very much at home, I was also in inner turmoil about the implications of such a change of direction. Happily however, I came to realise that this was the life God wanted me to live and subsequently, on August 6th of that same year, I entered as a postulant. I still marvel at how God brought me here and gave me all the graces, help, courage and strength I needed, not just to enter but to complete my time as a postulant and novice. On 22nd of June, 2009, with great joy and peace I took my first vows and am now a Junior, hopeful that with the continuing support of the community and the grace of God I will ultimately make final profession.